What the clunker policy really proves is that Americans aren’t stupid and will let some other taxpayer buy them a free lunch if given the chance. The buying spree is good for the car companies, if only for the short term and for certain car models. It’s good, too, for folks who’ve been sitting on an older car or truck but weren’t sure they had the cash to trade it in for something new. Now they get a taxpayer subsidy of up to $4,500, which on some models can be 25% of the purchase price. It’s hardly surprising that Peter is willing to use a donation from his neighbor Paul, midwifed by Uncle Sugar, to class up his driveway. On the other hand, this is crackpot economics. The subsidy won’t add to net national wealth, since it merely transfers money to one taxpayer’s pocket from someone else’s, and merely pays that taxpayer to destroy a perfectly serviceable asset in return for something he might have bought anyway. By this logic, everyone should burn the sofa and dining room set and refurnish the homestead every couple of years. 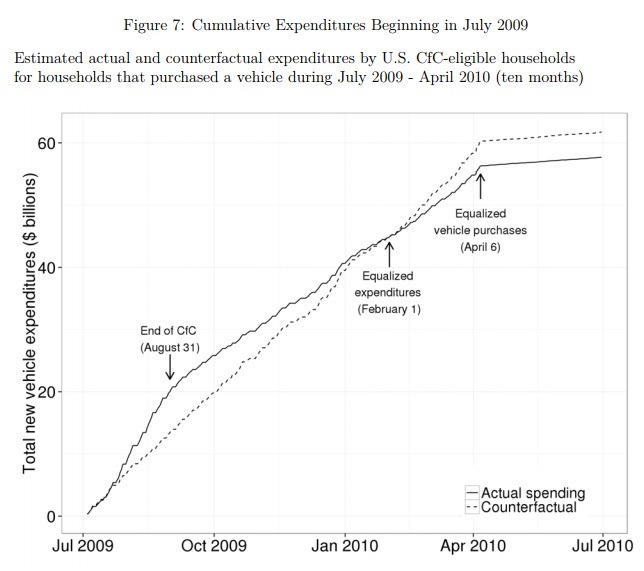 …it’s not clear that cash for clunkers actually increased sales. Edmunds.com noted recently that over 100,000 buyers put their purchases on hold waiting for the program to launch. Once consumers could start cashing in on July 24, showrooms were flooded and government servers were overwhelmed as the backlog of buyers finalized their purchases. Secondly, on July 27, Edmunds.com published an analysis showing that in any given month 60,000 to 70,000 “clunker-like” deals happen with no government program in place. The 200,000-plus deals the government was originally prepared to fund through the program’s Nov. 1 end date were about the “natural” clunker trade-in rate.